Packaging: Individual sterile blister pack. Properties: Reduces injection related harms, such as: abscess, phlebitis, “dirty hits” embolism and oedema. Removes 90% of particles measuring more than 5 microns, 100% of particles 10 microns or larger. Retains less than a third of the drug residue held by makeshift filters. Indications: Prevention of tissue damage and infections related to inadvertent injection of insoluble particles. Promotes the single-use of filters. Helps reduce risk of blood-borne virus transmission. Caution: Sterifilt® degrades and may become blocked after use. 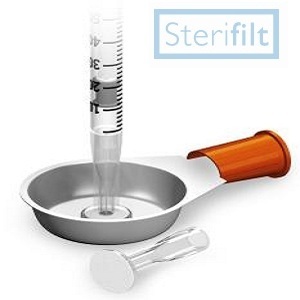 Sterifilt® does not filter out viruses or bacteria. Clinical history: Developed in France since 1998 in conjunction with needle exchange programs. Safety and efficacy validated by laboratory assays. Tested with brown heroin (base), white heroin (hydrochloride), cocaine (hydrochloride), crack (cocaine base) amphetamines and crushed tablets. Directions for use: Hold vertically. Draw up fluid smoothly.